It Is What It Is: Put It In the Oven for Graham and Me! I was happy with the cake I'd baked and decorated for Graham, and he seemed to be pleased with it too. He recognized Mickey, which had been a concern of mine, and Cael was there to reassure me that it looked good enough to eat (my other concern). "Mommy, can I eat that cake?" "Not yet, honey. We'll have it after supper tonight." "But I want to eat it now! I want to put Mickey's tongue in my mouth!" I thought a discussion about having higher standards might be in order, as in requiring that one's future mate be a living, breathing person, but I decided to let it slide. After all, Oscar's high strung, compulsive nature has led to inappropriate relationships with the cat, various pillows, a red garbage can and even my ankle. Love really must come in all forms. The whole family came over and we had a very autumnal meal of grilled chicken breasts, pasta with homemade pesto and roasted root veggies. Cael and Graham ate virtually nothing, both with their eyes on the room full of prizes in the form of wrapped presents, cards and colorful ribbons, and one cross-eyed Mickey Mouse cake. When dinner was eaten and cleared from the table, we got down to the business of opening presents. There is no circumstance that better illustrates the differences between my boys than in opening gifts. Graham perused the pile as if trying to analyze which box holds an item worthy of the time it would take to open. As he robotically eyed the loot, Cael was in his face (and mine) making suggestions and shouting orders. "Graham! Open this one, Graham!" "Dat." Graham would say, motioning to a small silver-wrapped package. "YOU OPEN THIS ONE NOW!" Cael yelled as Graham's lip quivered and Oscar peed a bit in the corner. We had to literally hold Cael back to allow Graham his one moment in the spotlight and the luxury of opening his own gifts. The clear hit of the night was the stuffed Mickey that Joel and I had debating purchasing as it was close to $20 and didn't "do" anything. But Graham wasn't bothered by the mouse's simplicity as he snuggled it tightly and demanded no one else touch it for the duration of the night. With little children, birthday parties are simultaneously celebratory (for the birthday boy) and torturous (for the brother) as the kids struggle with sharing. 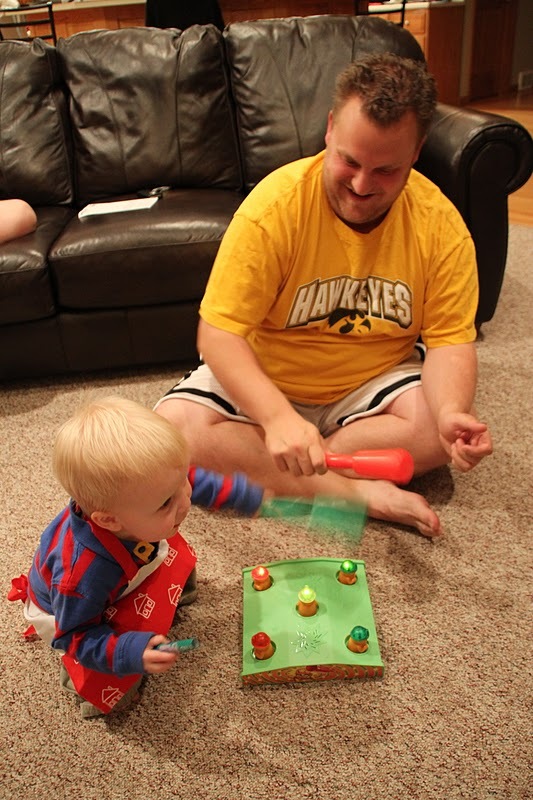 We quickly learned that sharing can be a tough pill to swallow for Daddies, too, as Joel was immediately drawn to Graham's "Whack-A-Mole" game like a stuffed moose to a stuffed dog. Once all of the toys and books were broken in or simply broken, it was time to cut the cake. I uncovered it and smiled at my handiwork. Just then, one of my nephews walked by and casually questioned my masterpiece. "Why does it say he's 22?" But just then I realized that by putting two "two"s on Mickey's ears, I had unintentionally suggested that my as-yet-incontinent son had skipped 21 years of school, dating and life and was ready to graduate from college with very immature taste in television programming. "Why did you put "two" on there twice?" Y? Because I liked it! "I don't know... I thought it looked best on the ears, and Mickey has two ears." What was there to do about it? Graham was in position at the table and anxiously awaiting his Mickey cake to devour, digest and return to me in a much stinker and less appetizing format. So we pushed a couple of candles in, lit them and stepped back. With the lights out, the flames above Mickeys face illuminated him in a way that cast an evil glow on his innocent face. Mickey looked as though he was cackling at me and glaring with his crossed eyes. But Graham didn't care. We sang "Happy Birthday" and he gasped with excitement at the cake I'd made for him. I helped him blow out his candles and he quickly gobbled down his dessert. As he filled his tummy, he rubbed his eyes. Once finished, his eyes glazed over, we kissed our big boy goodnight as he snuggled up to Barker and Mickey and closed his eyes. So even though I can't count, and Cael was being very "Cael", and Oscar rubbed his arms raw and hairless, Graham's birthday was a success. He loved every minute of it and I am happy we were able to give him a special day. I hope that next year's cake is just as special and error-free. What's a good theme for a 23 year-old? Wasn't that awful? I couldn't look away once I saw it either. Argh! Cael won't be turning 44 this year, that's for sure.